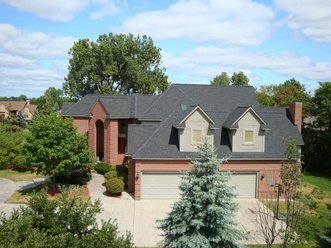 If your home is in need of a roof repair or replacement, it’s important you find the right roofing contractor near you. We’ve seen firsthand how frequently prospective clients search for ‘roofer near me’ when they turn to Google to help with this important hire. Your home and/or business’s roof and siding are its building envelope, and installing roofing materials properly will help safeguard your investment from future problems. Installing and repairing roofs takes experienced, skilled contractors. 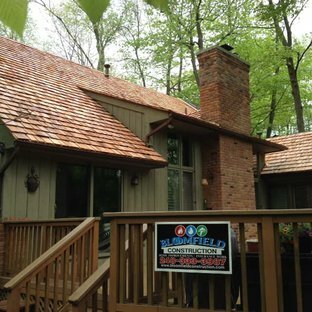 Years of experience can improve thequality of the end product, and ensure your roofing is done properly. Ask how long the company has been in business, and learn about the specific experience levels of the individuals that will be working on your project. A team filled with inexpensive contractors may make fundamental errors in your roofing, costing you money in future months and years. Does the roofing company have insurance? What about workmen’s compensation? Can they prove themselves to be a licensed builder? Are they knowledgeable enough to know what permits are necessary in your city? Don’t be too shy to ask to see their paperwork proving they have the credentials they say they do. If the contractor can’t provide them, don’t hire them. Which roofing company have your friends and family trusted to do their home’s work? Post on social media and you’re sure to find people ready to talk about their home project. Ask them about the experiences they had. Talk about the good, the ugly and the lessons learned. Inquire if they called other contractors, and why they selected the team they did. In addition to your personal network, it’s also a good idea to chat with others from your community. Check Facebook to see if your city has a local forum and ask others for their insights. Look at recommendations through the NextDoor app. These folks live close to you, they’ve likely researched and looked at the same options that you’re considering. Find out as many details as you can –– how was the company’s communication, did their pricing match up to the original quote, is there anything the homeowner would have done differently? You can also ask the contractor about other projects they’ve completed in your area and a list of references. If your roof replacement or repairs are necessary because of emergency damage, work done by the home contractor may be covered under your homeowner’s insurance. It’s helpful to hire a roofing contractor that has experience working directly insurance agencies. These teams know the ins and outs of handling homeowner’s insurance. They use up-to-date technologies to provide more accurate quotes and finish the job effectively. An insurance agent’s trust in a contract is an excellent indicator of the quality of their work. Take your time to be well researched in your decision. Talk to a few companies, ask them what makes them different and gather quotes from each. Don’t simply hire the cheapest contractor. Instead, get a sense for what industry averages are and the quality of the products used by each company. Your roof is an investment, and it’s important to know what you’re getting for your money. Protect yourself from potentially unknown extras by asking for line-item pricing list of extra materials. Hiring a well-known, reputable company near your home can protect you from scams. A trusted contractor should have an established office, digital presence –– including a website and social networks –– and creditable work. It’s rare that a home contractor should ever be contacting you to start a roofing project. If one does, beware. Storm chasers have been known to prey on home damage victims. This is why it’s so important to do your research before making a hire. We love the community we work in. The next time you search for a “roofer near me” –– give our team a call. We have decades of experience and work with only our own trained & trusted team of skilled tradesman.